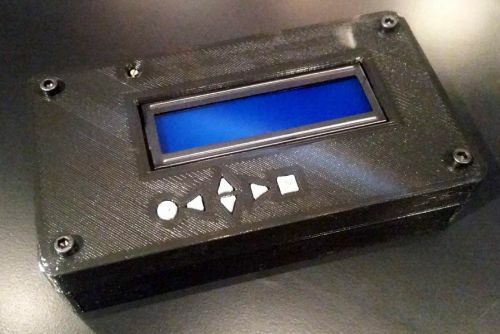 A 3D Printed Housing for the ST-V Multi-Selector LCD module for Darksoft's ST-V Multi cart for the Sega ST-V Titan arcade hardware. Printed in Black PLA with Silver PLA buttons, this housing helps keep the electronics protected, raised screw heads keeps both the LCD and the face of the housing from getting scrached up if accidentially placed upsided down while also providing a clean utilitarian look. Also included is a small support block that is placed between the main PCB and the button PCB to preven the PCB from flexing when buttons are pushed. An opening is provided on the right hand side to accomidate a ribbon cable, power and reset wires. another opening is available on the top to allow adjusting LCD contrast without removing the case. Includes the top and button housings, button extensions, four alen screws, and support block. DOES NOT include the ST-V Multi Selector LCD module.